Remember, remember the Fifth of November, The Gunpowder Treason and Plot, I know of no reasonWhy the Gunpowder Treason Should ever be forgot. 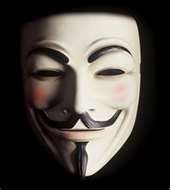 Guy Fawkes, Guy Fawkes, t’was his intent To blow up the King and Parli’ment. Three-score barrels of powder below To prove old England’s overthrow; By God’s providence he was catch’d (or by God’s mercy*)With a dark lantern and burning match. Holla boys, Holla boys, let the bells ring. Holloa boys, holloa boys, God save the King! And what should we do with him? Burn him! There have been terrible acts at OWS by the these occupiers and because of these acts they give us all reason to be concerned. As Catholics we pray that the worst among the OWS crowd sees this mask and this movie as entertainment and that life will not imitate art. November 5th is this Saturday.